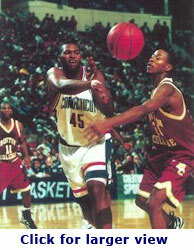 Eric Hayward was a Forward for the UConn Huskies from 1992- 1996. I spoke with Eric in September 2003 about his memories of basketball as a youth, his college career and his current lifestyle. Eric grew up in Alexandria, Louisiana with two younger brothers and two sisters. His mom raised the family after his dad was shot and killed when Eric was only 7. When he was in the seventh grade he started playing basketball and the junior high coach approached him about his potential, especially given his height, 6’4” – 6’6”. By the time he was a freshman in high school, he was already one of the starting players on the varsity team. While Eric was deciding which college he would attend, Washington State University, Temple and UConn were the schools he visited, however the University of Southern Louisiana, Tulane, Louisiana State University and University of New Orleans, were among others interested in him. It was Coach Howie Dickenman (Coach D. the former assistant coach at UConn) who was actively recruiting Eric. Coach D. started showing up at Eric’s games when he was a sophomore and it was a good strategy because Eric decided to go to the school that showed the most interest. His first choice would have been Georgetown University—it was known for its big men—but the school, with its already filled roster of tall players, did not recruit Hayward. Eric’s most memorable times at UConn were when he was a senior. The team had its most successful season, up to that point, in his final year, when they won the Big East Championship against Georgetown. Eric graduated in four years with a degree in Sociology. His education was very important to him, as exemplified by the fact that on a game night when they would get back home at 2:00 AM or 3:00 AM, he would still consistently attend his early morning classes. After college Eric took a few years off and enjoyed life, kicked back, did some partying and had fun. When he was ready, he made the decision to play overseas but he said he had a “shady” agent and the trip to Europe never happened. 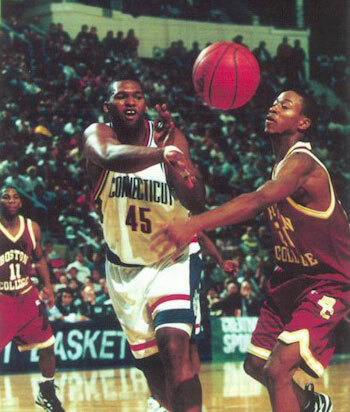 He then tried out for the Connecticut Pride, a team in the Central Basketball Association (a semi pro league) but nothing panned out there, so he tried the New Haven Neptunes another CBA team. After playing his first game, he received a phone call from his family that his brother was sick. It was now November of 1997 and he packed up his things and left Connecticut to be with his brother in North Carolina. His brother, Charles, was playing basketball for the University of North Carolina and was feeling very tired. He had some tests taken and was diagnosed with Leukemia. He was medically red shirted for his freshman year and came back the following year after going into remission. He played ten games that year, the team was getting ready to leave for Hawaii which he was very excited about. But prior to leaving, he went for a checkup and learned he was no longer in remission. He had to have a bone marrow transplant, for which Eric was the donor, but his body rejected the transplant, and he died in 1999. Eric’s family today is still trying to get over the loss of his brother. The former UConn player went back to Louisiana seeking a job working with children, but was unsuccessful. He returned to North Carolina, got a job as a security guard, saved his money, and came back to Connecticut, where he has lived for the last three years. Today Eric is 30 years old, lives in Meriden and works at a hospital, counseling children ages 14 to 17. He has an 11-year-old son, Marquis, who lives in Louisiana. He has a good relationship with Marquis and would like to eventually see his child move to Connecticut. Eric is planning on staying in the state and also hopes his mom and sister move here within the next year or so. He now plays basketball for pleasure and exercise. When not working, he enjoys watching movies or can often be found singing Karaoke—he’s a big Lionel Ritchie fan. Since his UConn career, he said Coach Calhoun has mellowed out a lot. The practices were harder when Coach D. was there. “Coach D. really worked us,” he said. He hopes to attend this year’s Final Four if UConn is one of the teams playing.